Frederick’s Wine & Dine was recently named one of the Top 100 Restaurants in Cleveland by Cleveland Plain Dealer’s Friday magazine, so some friends and I wanted to check it out. We dined there on a Tuesday night. It is located near Thistledown at the corner of Emery and Northfield Roads. It is located in a run-down strip mall, but don’t let that scare you off. The inside is cavernous, and I can see how live music would liven things up. The food was good (although some of my fellow diners were less enthused about their meals – the southern fried chicken and the southern fried pork chops), but the service was abysmally slow. They might have just had an off night, but if you expect good service from a restaurant (especially when there are only a couple occupied tables) you might want to go elsewhere. From the bartender behind the bar when we were the only four people sitting there (apart from one lone woman down a few seats from us) to the overwhelmed waitress who had problems taking our order in the first place (running around helping the three or four other tables that were seated in the restaurant) and remembering things we ordered (even forgetting to bring one latecomer’s salad until after her entree was served), the service was just lacking. But if you go to a restaurant for the food and not the service you might be okay. 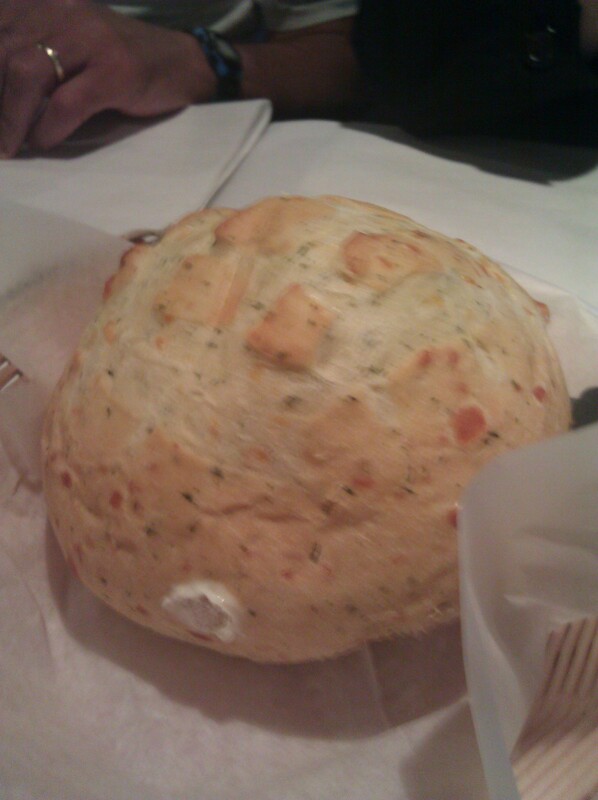 Once we finally got some bread it was delicious – a loaf of herb bread served piping hot with lots of soft butter. We really enjoyed the bread. The salad was fresh but nothing special – lettuce with a couple cucumber slices, croutons and shaved carrot and red cabbage. 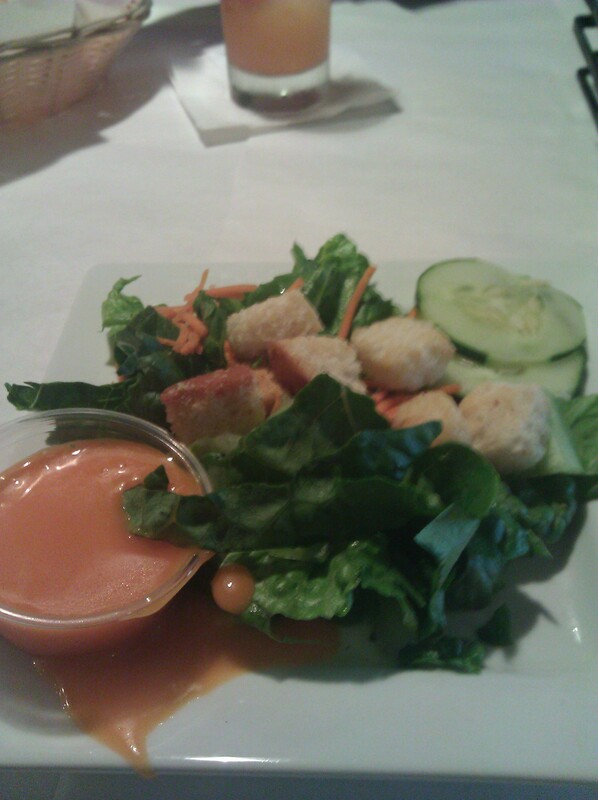 The dressing, which came in a cup on the side, was slopped over the side. I ordered the grouper dinner and chose to get it grilled. It was well seasoned with a slight Cajun kick to it. The fish was also moist and perfectly flaky. I also enjoyed the garlic mashed potatoes (with a Cajun seasoning sprinkled on top) and the cole slaw. I tried a bite of my friend’s fried grouper, and it was also delicious. There weren’t a lot of desserts to choose from, and they were out of a couple of them. The chocolate confusion one wasn’t available, so I ordered the Apple Betty, which was a nice Brown Betty made from apples and sweetened bread crumbs. It was a sweet ending to my meal that I enjoyed a couple bites of and then took home and had for breakfast the next day. I forgot to take a picture. I’ve tried it. I honestly don’t think I’ll be going back any time soon and neither will my other five dining companions. We just weren’t wowed by the place. I honestly don’t know how it got in the Top 100 or was voted an OpenTable Diners’ Choice. Then again, we might have just had a really bad waitress and come on an off night. 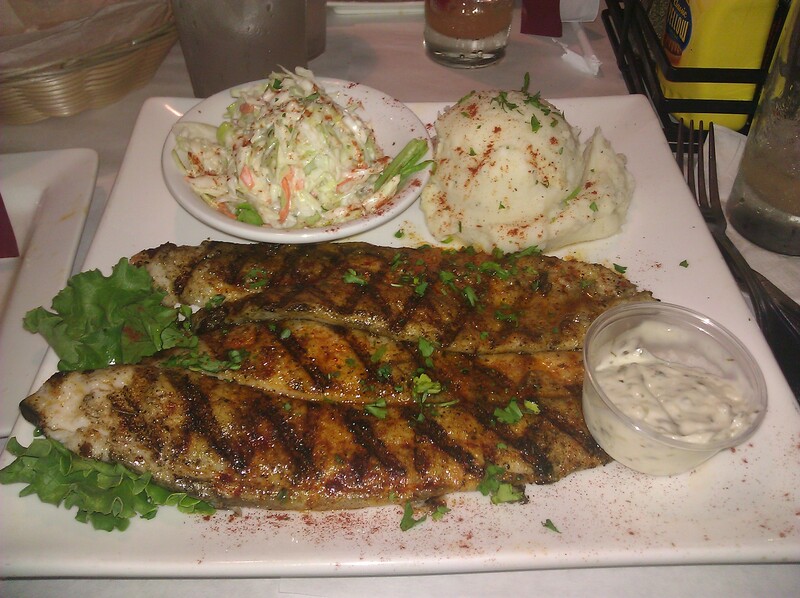 If you like grouper or Cajun food you should give it a visit.